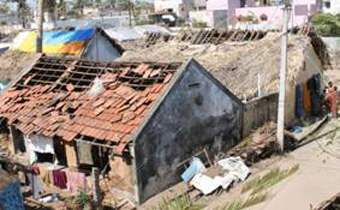 The cyclone named 'Thane" with the wind speed of 125 km/hr hit the Cuddalore, Villupuram, Nagapattinam District along with other Districts of Tamil Nadu and Pondicherry Union Territory on 29th and 30 th of December 2011 and caused severe damages. Caddalore district authorities estimated that 365882 houses were damaged. Out of which completely damaged huts 73292, partly damaged huts 196385 and partly damaged semi pucca houses 96205. The internally displaced people, whose houses were damages are living in the streets and are exposed to sunlight during the day time and severe cold at night. Cuddalore District's major livelihood means are cashew, coconut, sugarcane, casuarinas, agriculture and fishing. Around 8 lakhs hectares of standing crops were destroyed by the cyclone . Mostly 15 years old cashew trees were uprooted, fallen and destroyed by the cyclone. The coconut groves, jack fruit trees, cashew farms, sugarcane, wind breaker casuarinas plantations and most of the trees were uprooted. 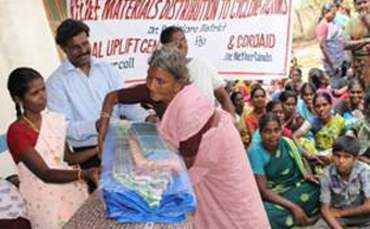 It is to be noted that 90 percentage of the bio-mass in Cuddalore was destroyed. The impact of cyclone has lost the livelihood means of the people, those who are mainly depending upon the cashew, Jack fruits, coconuts, casuarinas trees and agriculture. The fishing vessels and nets were damaged. The electricity supply system was completely damaged. Due to this the water supply system and communication system were completely paralyzed. 27 high voltage electricity towers, 147 transformers, 4500 distribution lines, 3600 electricity poles and 350 km long power lines were damaged. The failure of electricity system, the Panchayats and Tamil Nadu Water supply board was unable to supply drinking water to the people from 30 th of December 2011. The water logging in some places is a threat to further aggravation of health problems. 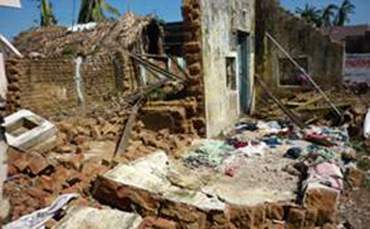 The cyclone uprooted the trees and damaged the houses. The streets and roads were filled with uprooted trees, garbage, debris of huts & houses and other wastes. The debris was not removed either by the local public or by local administration except from the National and State High ways. The rain followed by the Cyclone damaged Text books, Note books, School bags, uniforms and writing materials of students. The Average forest cover in Tamil Nadu is only 17%. But the Cuddalore District is having only 5% a meager forest cover. Now due to the cyclone "Thane" 90% of the forest cover of Cuddalore District was destroyed. This will have severe impact on the livelihood in future. 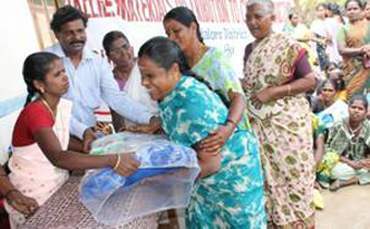 2000 families restored their normal life from the trauma and damages caused by the Cyclone. 2000 students are able to continue their studies without difficulties and prevented from dropout.